This summer I had a wonderful dinner with my friend Julia at a very attractive bed and breakfast near Arrezzo in Tuscany. The two men who run this are lots of fun and serve delicious food and great wines. Here is my interpretation of their Pear Almond Tart which is best made with pears when they are at their best, in the autumn. To find out more about Casa Portagiois, check out www.tuscanbreaks.com. processor, and process until the mixture ressembles breadcrumbs. 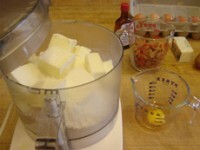 In a small bowl or measuring cup, mix together the egg yolk, with the vanilla and water. With the machine running, pour in this mixture and process until the dough just comes together. Press the dough into the bottom and up the sides of a 10 inch springform pan and chill until needed. Meanwhile, peel, halve, and core the pears. 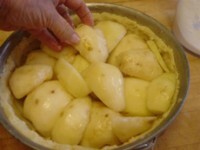 Spread the breadcrumbs over the bottom of the prepared tart shell, and arrange the pears all over the bottom with the rounded side out. You may need to cut some of the pears to fit in the shell. 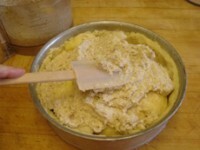 To make the filling, put the sugar, butter, almonds, whole egg, flour in the food processor and process until smooth. 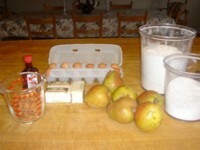 Cover the pears with the almond mixture. Bake in a preheated 375 degree oven until golden brown, approx. 1 hour. 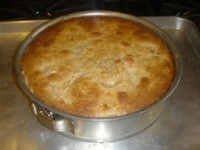 Let rest for an hour before serving (This torte will keep in the fridge for a week). 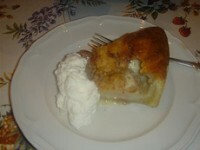 Serve with lightly sweetened whipped cream mixed with mascarpone.